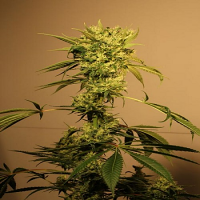 Blue Thai has, been crossed with our fast flowering Blueberry with Thai Skunk, a hybrid from the Netherlands that combines the high quality of Thai genetics with Skunk´s high yield. 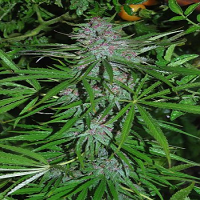 Thanks to the fast flowering of our special Blueberry, Blue Thai flowers in only 8 weeks indoors, and harvested by the 10th of October outdoors. This speedy flowering allows its use on balconies, gardens, terraces, guerrilla growing and of course greenhouses, with guaranteed success. 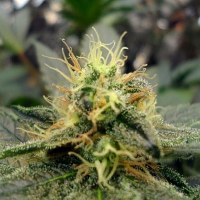 Blue Thai is quite resistant to mould, because thanks to its quick flowering time it is less, exposed to moisture, and thanks to the genetics used in this hybrid, as they are quite resistant to mould themselves. Blue Thai is very sweet with a touch of Thai acid, but always dominating the sweet fruity Blueberry. 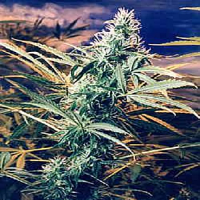 Produces much sticky resin in the second half of the flowering stage, and if the night temperature drops significantly, leaves and flowers turn violet and purple, a delight to behold.